Chianti Rufina from Cerreto Libri. Andrea Zanfei. Photo by Alex Finberg. 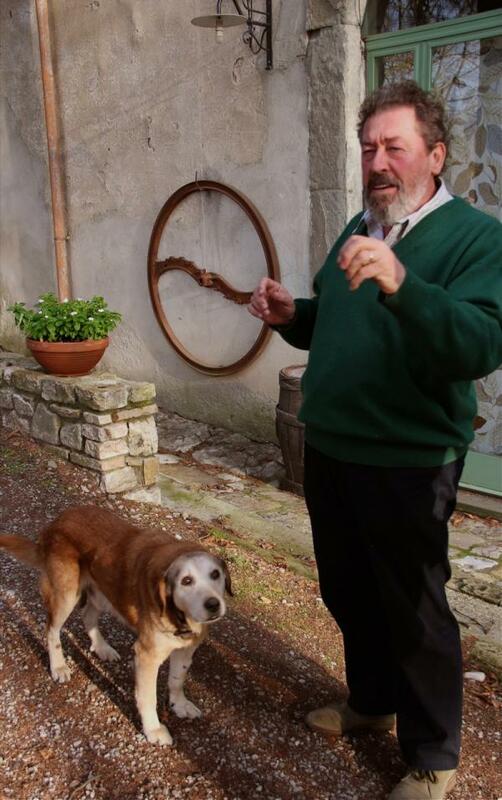 Fattorie Cerreto Libri is an 80 hectare farm run biodynamically by Andrea and Valentina Zanfei. The villa dates back to 1796, and is of considerable importance from an architectural point of view, since the foundations most likely sit on abandoned Etruscan towers that have been reconfigured to build the current shape of the building. The region of Chianti Ruffina differs from the rest of Chianti because of its unique climate. This is mostly due the merging of the Sieve River with the larger Arno river, which results in noticeable temperature differences between day and night, as well as a lot of humidity in the early morning and at dusk. Because there are so few producers in Ruffina (around 20), D.O.C regulations are less exposed to the flexibility of Chianti Classico, and the region has remained more rooted in tradition. The Zanfeis cultivate the area's traditional grapes: they adamantly defend their strains of old Trebbiano and Malvasia, not just for Vin Santo but also to make a fresh, typical dry white from the area. In red, Sangiovese (which was the "least important" varietal when they first started), Colorino and Canaiolo are grown, and Andrea proudly works with older strains of these almost forgotten grapes. Everything is fermented in concrete tanks. Andrea only fills them up to about 75% and never presses the grapes. The fermentation is therefore a pseudo semi-carbonic maceration but with with numerous remontages and in concrete. No new oak is ever used for aging. Sulfur is never added during vinification or at bottling. 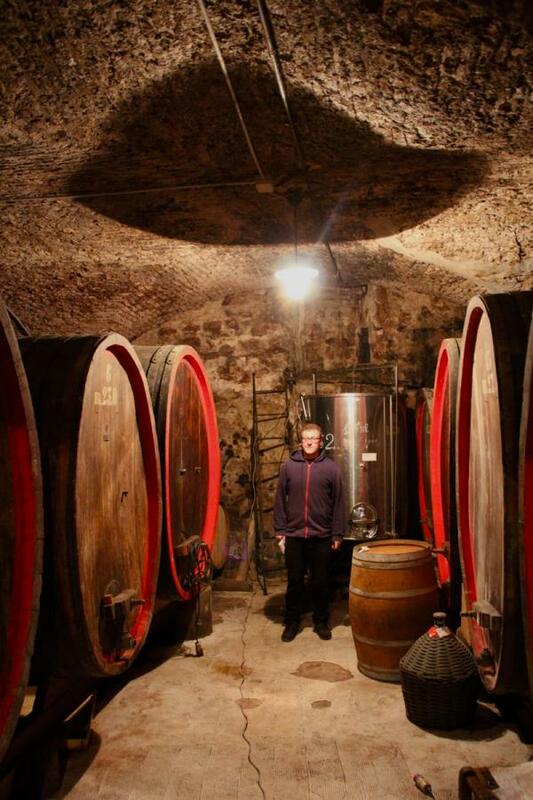 This interview with Andrea Zanfei took place in his cellar during a visit in November 2011. It was conducted by Kevin Mckenna and translated to English by Pietro Straccia. Tell us about Cerreto Libri. We are located in the region of Chianti Ruffina in Tuscany, which differs from the rest of Chianti because of its unique climate. This is mostly due the merging of the Sieve River with the larger Arno river; this results in a particular micro-climate with noticeable temperature differences between day and night. We also get a lot of humidity in the early morning and at dusk. We cultivate the area's traditional grapes. For white we adamantly defend our strains of old Trebbiano and Malvasia, not just for Vin Santo but also to make a fresh, typical dry white from the area. In red, we work with Colorino, Canaiolo, and Sangiovese (which was the "least important" varietal when we first started). Our passion is Canaiolo, and we are lucky enough to be making wines from older strains of it, which are 35 years old on average. Can you explain how this winery exists? 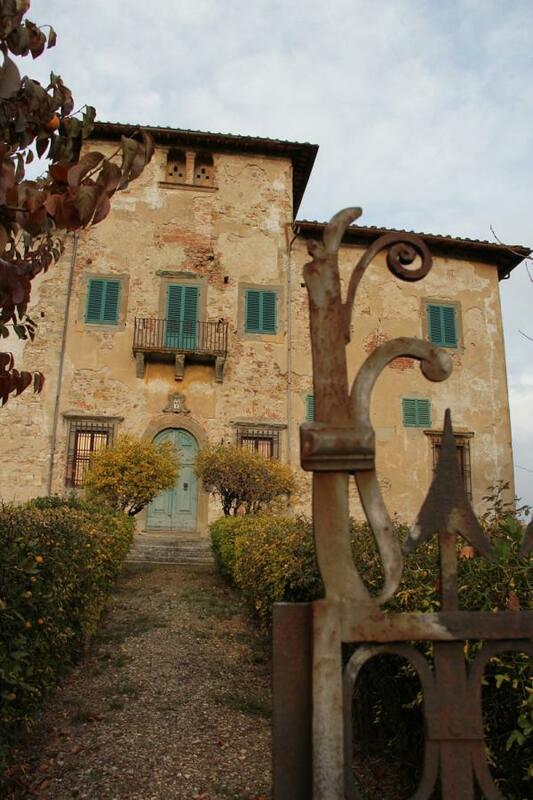 The property is ancient: the villa dates back to 1796! The great historian Paganello established its' origins, and it turns out the edifice is of considerable importance from an architectural point of view, because the foundations most likely sit on abandoned Etruscan towers that have been reconfigured to build the current shape of the building. The villa was bought from the Baldini family by the Del Rosso family. The Del Rosso's daughter eventually married a man from the Libri family. Both were established, affluent families, and at the time marrying a woman came with a considerable dowry. This is how the property got much bigger. The subsequent generations have kept busy to this very day. The owners have never changed. I’m not the owner. The owner is my wife. So I just follow orders and collaborate (laughs)! That’s the idea. When did you personally get involved? My wife Valentina and I started to work together in 1997. The big leap was deciding to switch from farming conventionally (which had not been very invasive, even until that point), and immediately converting everything to biodynamics. It was a decision made in conjunction with the generational shift happening in the vineyard; the older farmers were all leaving, so the need to change and rebuild was obvious. We rebuilt with this new system. 1997 was the year we took agriculture back into our own hands. It was necessary to renovate the farm, and in this idea of renewal we also decided to change our work methods. We had already spoken to many friends and other people about the importance and richness of biodynamic agriculture, so we wanted to implement it immediately. I must say that we did not have any difficulties. 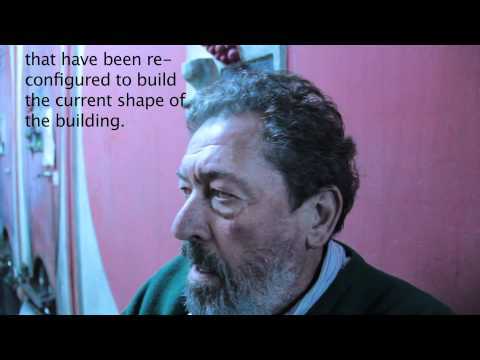 We had a consultant, Leonello Anello, who gave us a hand during the first few years so things were fairly straightforward, with no major hurdles. You've been working the farm since 1997, but up until very recently, you had a whole other career on top of running the azienda. Can you tell us about that? I was a professor in high school. I taught history and philosophy, and this year, after a full career, I retired. So yes, up until very recently, you could say I had a double engagement. But I never struggled too much doing both. School would keep me busy mostly in the morning, so aside from reunions and preparing my lectures, there was enough free time to take care of the farm and the vines. Not much though! There were many times when I had to be at school when all I could think about was the work that needed to get done on the farm! Besides the climate, can you elaborate on the differences between Chianti Ruffina and Chianti Classico? Because there are so few of us in Ruffina (around 20 producers), our D.O.C regulations are less exposed to the flexibility of an area like Classico, where there are so many more growers. It's therefore a place more rooted in tradition than what Classico has become. I believe that the fundamental difference is that we are allowed to make Chianti that is 100% Sangiovese. I don't believe this is the case anymore in Classico. There are many conversations and debates about “Natural Wines” these days. What do you think of this way of classifying the wine? It’s a great question and a very complex problem. I always try to solve it with a simple solution: we should be able to ask other producers to certify the wine for us instead of individually claiming it is natural ourselves. Those who work biodynamically or organically have already made a certain type of choice, they have a certain frame of mind and attitude. Not only that, but they actually pay a panel to be controlled! This is one side of the equation, and unfortunately there are those who work "naturally" only to obtain a profit. When you make wine to make profit, you will always treat wine production like an industry, which often leads to less than honest decisions. If you begin an agricultural process thinking: “My investment must bring in a lot of money to make it worth my while” you are steering away from what agriculture means in the first place! Agriculture is something else. Agriculture is a necessary and indispensable production that feeds us and protects our land. If there is no agriculture, there is no land. In our modern society, part of the land has to be used for industry. But to try and submit all of our land to industry is foolish. There are so many recent examples of this backfiring: the unbalance of using (or exploiting) a territory creates a serious potential for total disaster. We believe that a natural product is simply a product that confronts these issues. Which wines do you like from other areas of Europe? Ah, I like almost all wine. Us producers start from just that. Clearly a passion for the product. We’re all motivated for one reason or another but I personally find French wines very interesting. None of us can deny their quality. I also very much enjoy, for example Istrian wines. Wines that come from certain areas of the world who are now experimenting with new techniques. The Georgian concept with the use of amphora is beautiful. After all, I work with cement which is a modern day amphora! I like wines where there is a degree of research. Where there is a willingness to extract the environment. I notice that, for example, when you drink certain Sicilian wines you are capable of envisioning Sicily. This is a quality I value. This visit at Cerreto Libri took place in November, 2011. After a "light" lunch at Montesecondo, we were off to visit Rufina and Fattoria Cerreto Libri. 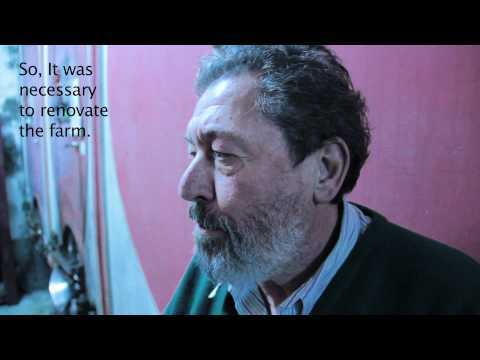 The 80 hectare farm is headed by Andrea Zanfei and is run biodynamically. Andrea explained that the farm dates back to the 19th century around the time of Leopold the 2nd. It used to be organized by separate houses: many small houses were spread across the land for shape-croppers, one house was for workers and animals (usually filled with two families or one big family of as many as 20 people), another was reserved for the land manager, and finally the main residence belonged to the owner, who naturally had servants. All in all, about 50 people lived on and actively worked the land. The vines had never been a priority up until the last ten years, and Andrea jokingly explained that the parcels are spread across the farm like "leopard spots". Before entering the cellar, Andrea showed us his de-stemmer, which Kevin thinks is probably one of the earliest models ever made. He also showed us a huge pile of gross lees. Then it was off to the cellar. Everything is fermented in these beautiful concrete tanks. Andrea only fills them up to about 75% and never presses the grapes. 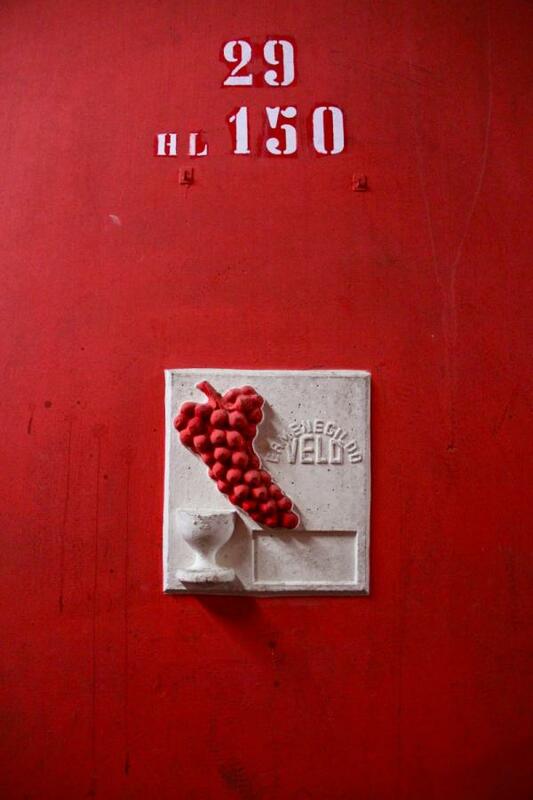 The fermentation is therefore a pseudo semi-carbonic maceration, but with with numerous remontages and in concrete. No new oak is ever used for aging. Sulfur is never used during vinification or bottling. From concrete we tasted a tank of 2011, and a 2007 Chianti Rufi re-racked from barrel which Andrea plans to bottle in a month or two. It was light and easy with bright fruit and the wood wasn't overbearing but rather well integrated. We also tasted some 2010 in tank without wood, some Canaiolo 09 in barrel and a standout Sangiovese 09 in barrel that had ripe, young fruit and strong vibrant acidity. Looks like it'll be a keeper. Here's my "Wine Spectator Editorial" pic. Vinification: Fermented in cement, aged in in steel and fiberglass. Vinification: Fermented in concrete, then aged in large wooden barrels.